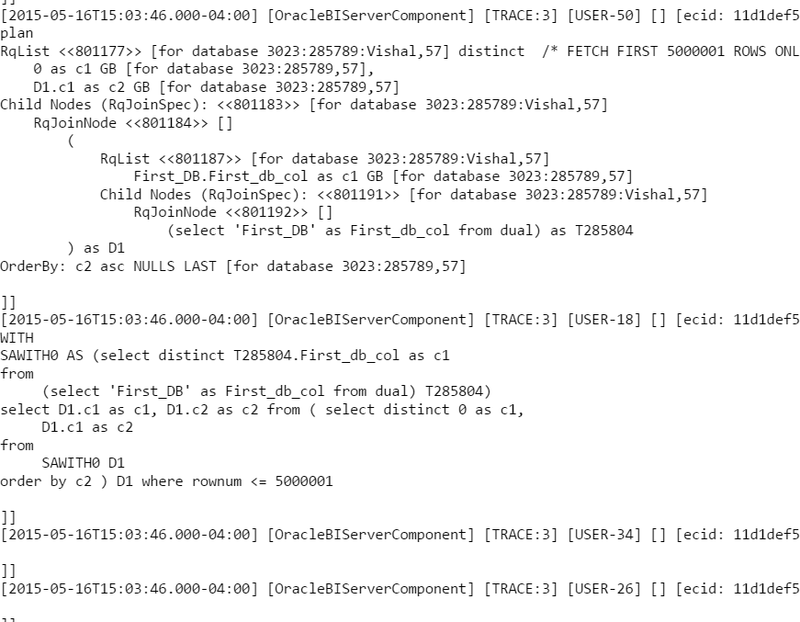 We have a replication and the primary database server. Replicating the data takes some time so the replication server is usually a few mins behind the primary server. The requirement for one of the report was to get the data from the primary server if the replication is lagging by over 1 min. This blog talks about a method to implement this business use case. In my project, we have a table that tells us the last refresh time of the replication database. We compare it with current time to find out the lag in mins. 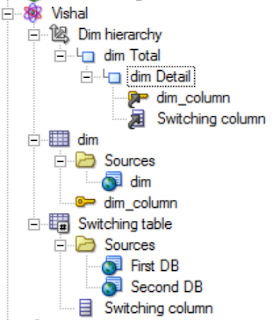 When the value in dim table is 'First' we will want the first database (replication database) to be queried and when the value is 'Second' we will want the second database (primary database) to be queried. Let us now look at the implementation. Let us start with the physical layer. 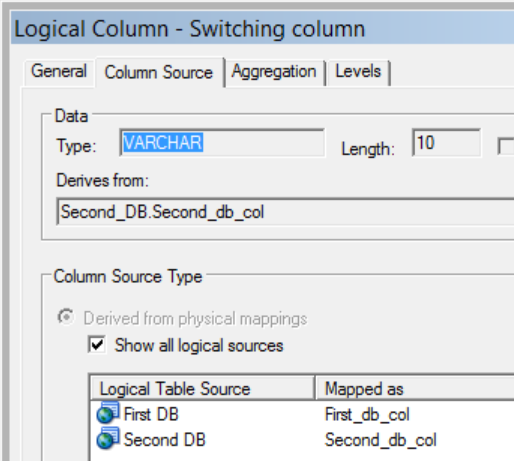 I have 2 database objects in my physical layer. Note: 'Vishal' database object here is my replication database. 'Vishal switching db' is my primary database. 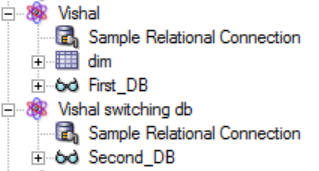 Vishal database object has a view called First_DB. This view has the following query. 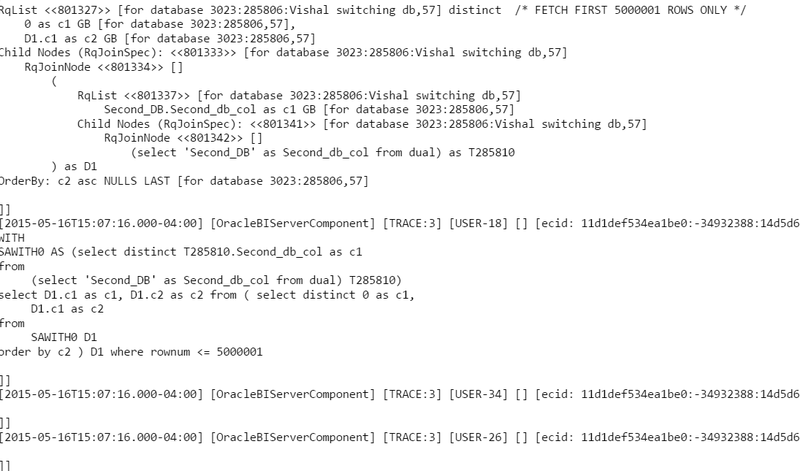 Similarly Second_DB of Vishal switching db database object has the following definition. I have already given the description of dim table in the beginning of this blog. Let us now look at the joins between these tables. 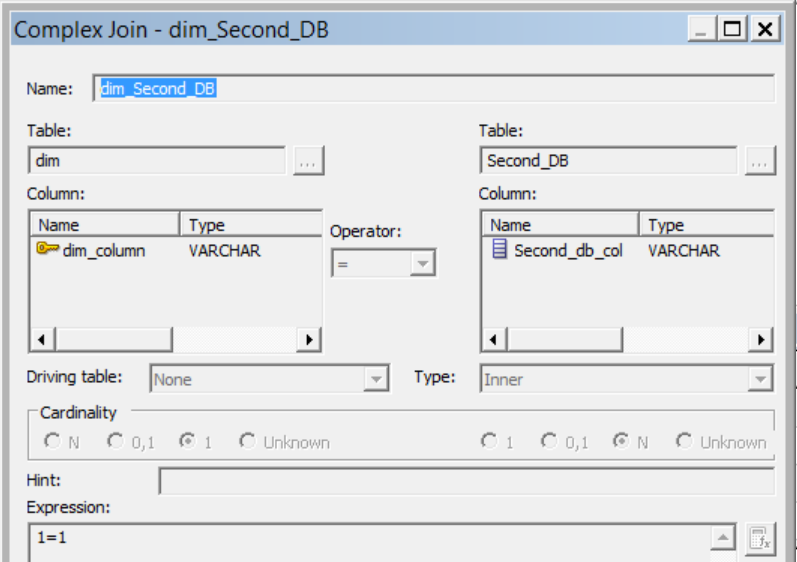 The join between Second_Db and dim is 1=1. This join has been put in place because we need dim table for fragmentation. Hence a join in the physical layer will be necessary. However, we don't have a key or any logical relation to join the tables. So the join is 1=1 as shown below. Similarly the join between First_DB and dim is also 1=1. 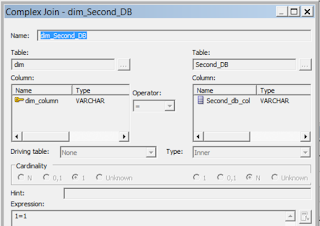 The difference between Second_DB-dim join and First_DB-dim join is that Second_DB-dim join is a cross database join while First_DB-dim join is not. We have dragged both the views i.e. 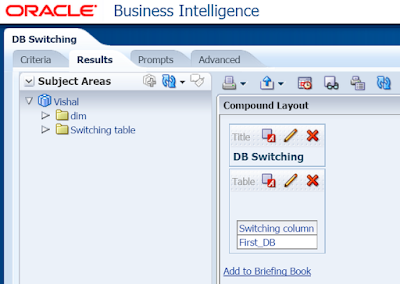 First_DB and Second_DB into a logical fact called Switching table. We have created a dimension out of the dim table. 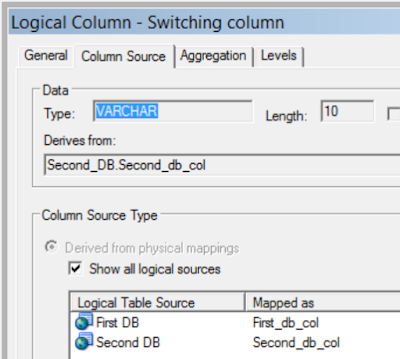 Switching column is a logical column and is mapped to both First_DB and Second_DB. 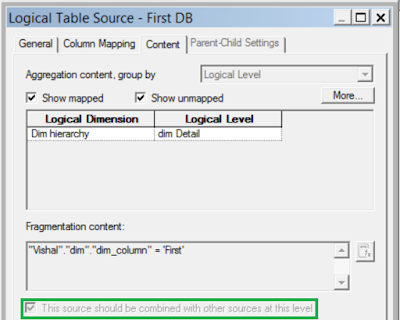 The logical table source (LTS) First DB has the following fragmentation content and level setting. 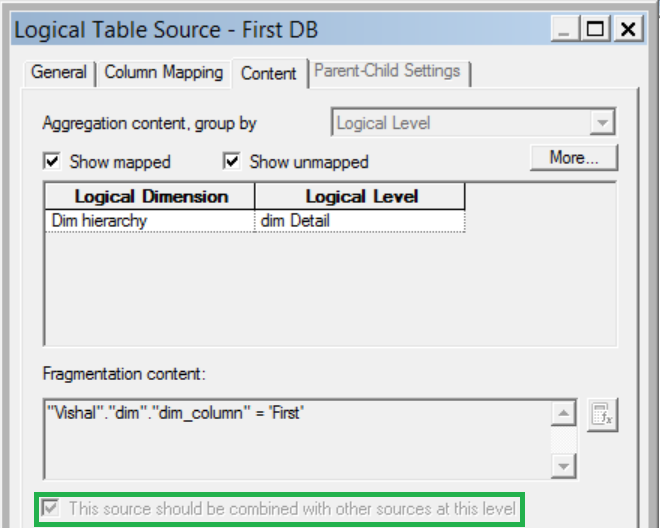 Note that the 'This source should be combined with other sources at this level' check box is checked. 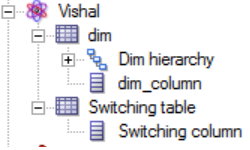 Dim hierarchy is a regular level based hierarchy created on top of the dim table. The join in the BMM layer look like the following. This whole model is dragged into the presentation layer. 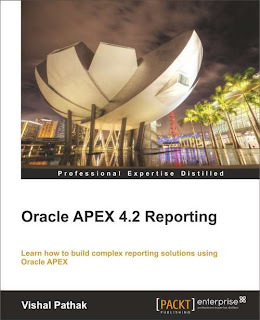 Let us now look at the Analysis part and the physical SQL created by the analysis. Note that I have hardcoded First in the filter. In a project, you would want to use a variable here. This variable can be linked to an init block or can be a presentation variable. This init block should find out the lag in the replication server and then put either First or Second as a value in the variable. 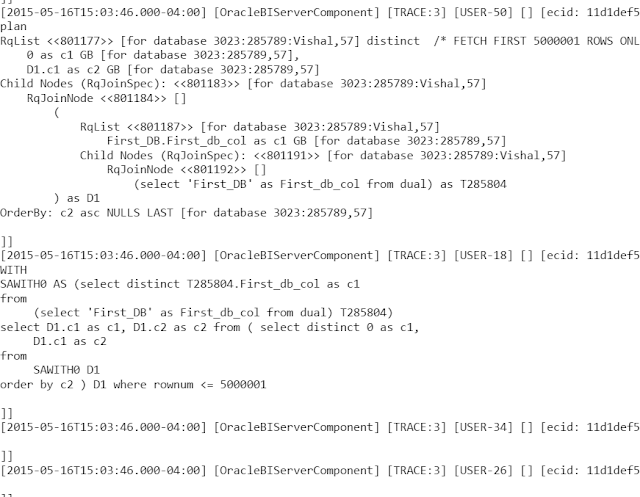 Let us now look at the physical SQL generated by the 2 queries. We note that OBIEE only sends the query to the relevant database. Screenshots of the queries are shared below. 1. The log does not even have the query fired on the dim table. This is because the joins are such that the dim table is not required to fulfill this request. 2. The correct LTS is picked up based on the value passed as a filter from the analysis. 3. dim table will be required in the init block that will load the variable used as a filter in the analysis. 1) Why cross DB join? 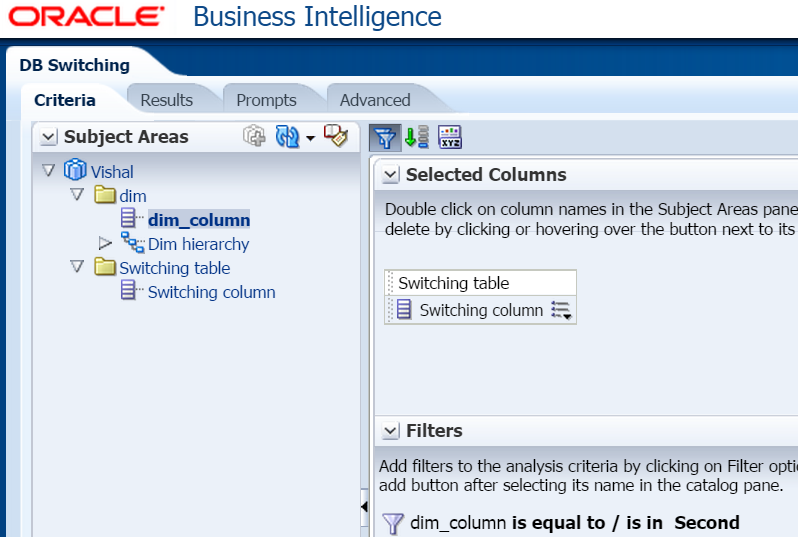 2) Why only one value in table at a time for Fragmentation Content? 1. 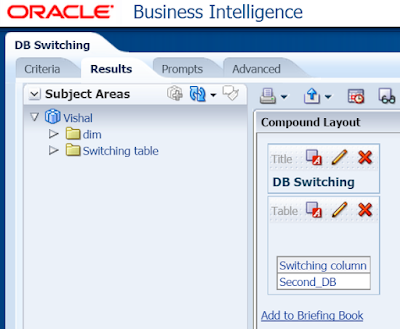 Because you only have to maintain the table used for switching (dim) in this case, in one of the 2 databases. 2. 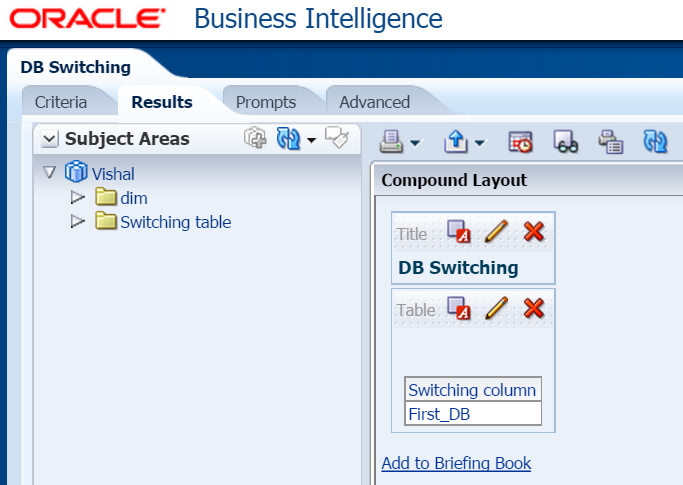 Because you have to switch the database. I dont think you understood the blog at all. Disclaimer: All views in this blog are personal. These have nothing to do with my employer or Oracle.